Lavender and metallic gold loop and swirl against an opaque white background in this handmade glass pendant. The effect is one of great depth. 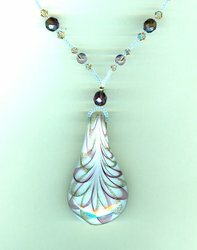 In keeping with the simple beauty of the pendant, the strand features matching glass and crystal beads spaced by pearly white seed beads. The hook and extender closure gives the necklace a working length of 17-1/2 inches to 20-1/4 inches. 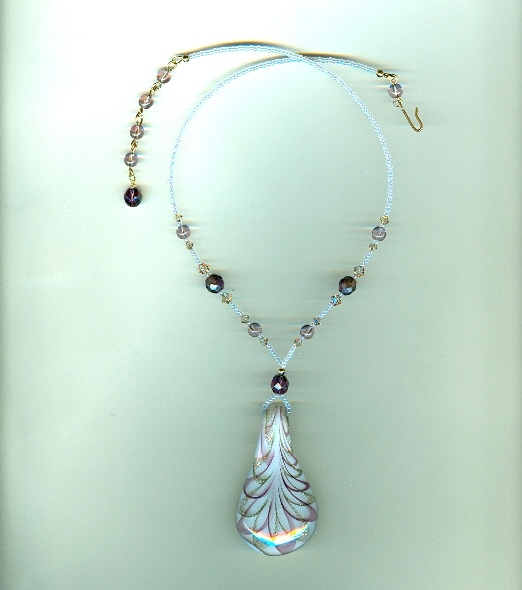 The pendant drops about three inches below the strand. For simple elegance, look no farther than SPARKLE PLENTY.